I downloaded the new Blue Table Painting DVD that they are selling through MiniWarGaming. I’m a MWG Vault member so I can download all their video releases and figured I would give this a shot. BTP seems to get short shrift online for their painting and ‘style’ but I wanted to give this an honest shot to see how they do their videos. The video you can download comes in 7 parts: the Introduction, Value Tinting, Color Shading, Focused Drybrushing, Speed Painting 1 and Speed Painting 2. The introduction has the hosts of the DVD talking to camera. One is the Quality Control manager for Blue Table Painting, and the other is the guy who shows all the staff painters how to paint their models in the Blue Table style. They quickly move on to show a range of sample brushes and talk a little about the paint they use – they’re not too brand-heavy when it comes to paints (and they seem to use all Vallejo stuff) and because they drybrush everything they don’t use sable brushes, just bundles of cheap brushes in various sizes. Because BTP is all about fast painting they do mention that having lots of paints avoids having to color match custom mixed paint, which is a good point. Unfortunately, pretty early on you can see problems with the video work itself. The first thing I noticed is that the camera they use seems to be on autofocus, so when the artists pick up the brushes to show you something about a brush, it’s immediately out of focus. Also, the artists didn’t understand that their hands and brushes need to stay in a certain area to stay in the camera frame, so the camera person often has to zoom out and pan around to find the brush in the hands of the artists. Pretty annoying, but for someone looking to paint an army quickly it’s good for them to know they don’t have to get expensive Kolinsky sable hair brushes or a particular and hard-to-find line of paints. 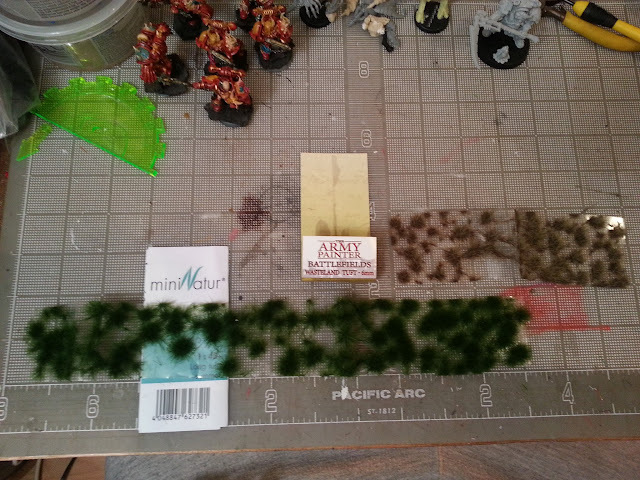 In case you guys are wondering about the grass tufts I use on many of my bases, the place to get them is http://www.antenocitisworkshop.com/silflor and STAY AWAY from the Army Painter stuff unless you just can’t find the color you want in the other brand.